Older adults who live alone may find themselves worrying about dangerous possibilities like accidents and break-ins. But maintaining your independence doesn’t have to involve sacrificing your security. The Samsung SmartThings Smart Home Hub is a highly intelligent system that offers you security, smart control, and instant alerts. This system not only gives you added security within your home, it also lets you conveniently and easily control all the smart devices you own, making life simpler for you and your caregiver. Customers and reviewers often mistake the Smart Home Hub for a home security system, which it is not. So if you’re expecting a system that detects intruders or break-ins, you may be disappointed. What you do get with a Samsung Smart Home Hub, though, is a home monitoring system that allows you to control several sensors, plus any compatible devices and electronics in your home. While the hub doesn’t offer the most reliable connectivity, it’s otherwise a great device to assist with your everyday life. Smart devices have become all the rage during the 21st century, so much so that adults are insisting their aging parents and grandparents invest in smart home control centers. The Samsung Smart Home Hub is a home monitoring system that controls sensors, lighting, and temperature along with any other compatible devices you own. This could include your stereo, your TV, smart refrigerators, and smart washing machines. What’s more, everything that is connected to the Smart Home Hub can be controlled through the system’s app on your smartphone or tablet. So how does this affect you? As a senior or a caregiver,, you want to make life as simple as possible, and this Smart Hub can do just that. SmartThings began back in 2012 as an independent company. Samsung acquired this smart technology startup in 2014, striking a $200 million deal to allow SmartThings to operate as an independent company within its Open Innovation Center. It has since been developing a line of smart home equipment designed to make life easier. The SmartThings Smart Home Hub was created, and with it, many smaller, compatible devices like motion and moisture sensors, locks, garage door openers, speakers, and thermostats. When SmartThings was bought out by Samsung in 2014, it was referred to by Forbes Magazine and Mashable as one of the top startups and smart home companies to watch. Various technological reviewers have stated that if you are looking for a smart home geared toward monitoring and lighting, the SmartThings Hub is your best option. It has been praised for its use of a wide range of devices and its unique array of trigger devices and setups. Smart home devices are increasing in popularity, usefulness, and versatility, and Samsung is definitely making a name for itself in this market. Since it connects to more items than most smart homes, the SmartThings Hub is a good choice seniors looking to manage their technology from one central device. A recent drop in the price of the Home Monitoring Kit makes it a great time to try this product out. With the Home Monitoring Kit, users get the Hub, two multipurpose sensors, one motion sensor, and one outlet. In addition to that, with the Smart Hub, you’re able to control a vast number of smart devices and appliances throughout your home. At its current cost, you’re gaining a quality product for a great deal. 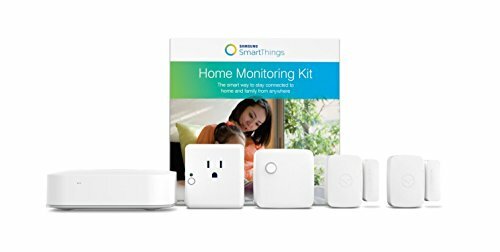 Samsung’s SmartThings website has an excellent page for assistance in setting up your Smart Home Hub. However, to make it easier for you, we will give you a brief overview of the steps you need to take to begin using your Smart Home Hub. The first thing you need to do to set up your Smart Home Hub is download the SmartThings app. You will need to create an account, which can be done using your email address and a customized password of your choice. Once you’ve done that, make sure you have connected your Hub to the power cable and plugged it in. If you plan on using an Ethernet connection, you can plug that line in as well. However, if you’re using Wi-Fi, there’s no need to use the cable. From the app’s dashboard, tap “add device,” then click “add device manually.” After this, you will be given step-by-step instructions to set up your Wi-Fi on your Smart Home Hub. When your internet has successfully connected to your Hub, you can start connecting devices. The process is similar for connecting other devices to your Smart Home Hub; tap “add device” on the app dashboard and follow the steps from there. You Hub will search for your devices, and you can pair as many things as you would like. All of your devices, once connected, can be accessed and controlled through the SmartThings app. Living independently as an older adult can be a challenge. Technology like Smart Home devices can help you take more ownership of your home and its devices. There are several reasons a senior—or a caregiver to an older loved one—should give the SmartThings Smart Home Hub a try. While the Smart Home Hub is not a full-blown security system (it won’t call a security system or the police if a break-in is triggered), it can help you feel safer and keep a closer eye on your home and property. The many versatile sensors and triggers included in the starter kit, which is available for additional purchase, can serve many purposes. You can attach sensors to your doors so that you get an alert whenever they are opened. Motion sensors can trigger outdoor or indoor lights when someone moves in front of it. Your app will alert you of unusual motion or activity within your home. The sensors are also useful for other types of home monitoring.. For example, the system has moisture sensors. These sensors are great to use on appliances like washing machines and dishwashers, so you know when they are leaking and not functioning properly. Many caregivers choose to use a Smart Home Hub to keep an eye on their baby boomer relative. While the system is installed in a senior’s home, their children or caregivers can set it up to send alerts to their phone. This is a great way to monitor things like doors left open, which can signal dementia patients leaving their home at odd times, for example. Unlike many other smart home devices, the Smart Home Hub is compatible with a very wide range of technology. It works with the Amazon Echo and Google Assistant as well as several smart devices including thermostats, refrigerators, lights, and washing machines. When paired with Alexa, you will be able to use just your voice to control your devices. Rather than controlling every device you own manually—and having to understand how each works—you can now control them all from your smartphone. This makes life a lot easier, whether you are the owner of the device or a caregiver. Your SmartThings Smart Home Hub has the ability to connect to your smart entertainment devices, like your TV and your Bluetooth speakers. With this capability, you can control your television simply by using your phone instead of struggling with three different remote controls. At the same time, you no longer have to deal with tuning the radio or inserting CDs. You can play your music right from your phone by connecting your Hub to your speakers. Using the SmartThings app and your Smart Home Hub, you can connect your devices and have them work together. Sync devices so that certain things—perhaps the lights in your home—turn off when you open the front door to leave the house. Additionally, you can create what are called SmartThings Scenes. Examples of these scenes are Good Morning, Goodbye, and Good Night. Create scenes to automatically turn on or off devices as a part of your routine. Your Good Morning scene may turn on the lights in your house, unlock the front door, and turn on the TV for the morning news. A Goodbye scene may turn off appliances, turn down the thermostat, turn on a burglar light, and lock the door behind you when it senses you have closed it. The options are endless for what you want your system to do. The SmartThings Home Hub has a long list of customer reviews, which can be helpful in deciding if it’s the right device for you.. Many of their experiences offer helpful takeaways for shoppers who are on the fence. Many reviewers highlighted issues with connectivity. While the Smart Home Hub is capable of connecting an unlimited number of devices, sensors, and appliances, buyers have noted that the range of the Hub is not very far. For this reason, it is highly recommended that you invest in other SmartThings Outlets and Z-Wave devices to expand the range of your connectivity. This is especially true for larger homes. Several reviewers also recommend the purchase of a smart camera/doorbell. These smart devices can connect with your Smart Home Hub and give you the ability to get alerts when someone is at your door with a video notification. It also lets you turn on your lights when you have a visitor and can save recorded video. One user recommended putting a motion sensor on or near your couch so that whenever someone sits down, the lamp next to them turns on, which is a nice, hospitable touch. Lastly, one reviewer stated that if you are interested in taking the time to learn about this system and figure out its capabilities, then it is worth it. For other seniors who aren’t interested in investing this amount of time, it may not be a good buy. The Samsung SmartThings Smart Home Hub has so much potential. Its connectivity across multiple devices like like Google Assist and Amazon Echo make it a platform for endless possibilities. It can also help seniors and their caregivers monitor their homes right from their smartphones, adding an extra degree of security. However, connection issues and tedious setup stand in the way of making this a truly great product. If you’re an older adult living alone – or someone who cares for an older adult – make sure you take these drawbacks into consideration before making your purchase.